23-10-2015 - A good overview about how Erik Buell started. Written by Court Canfield and Dave Gess, for the book 25 Years of Buell. 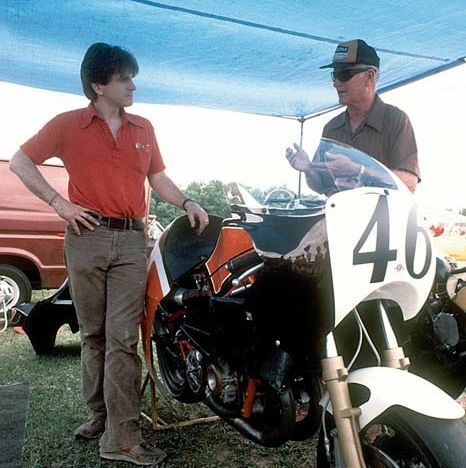 A good overview about how Erik Buell started. Written by Court Canfield and Dave Gess, for the book 25 Years of Buell. 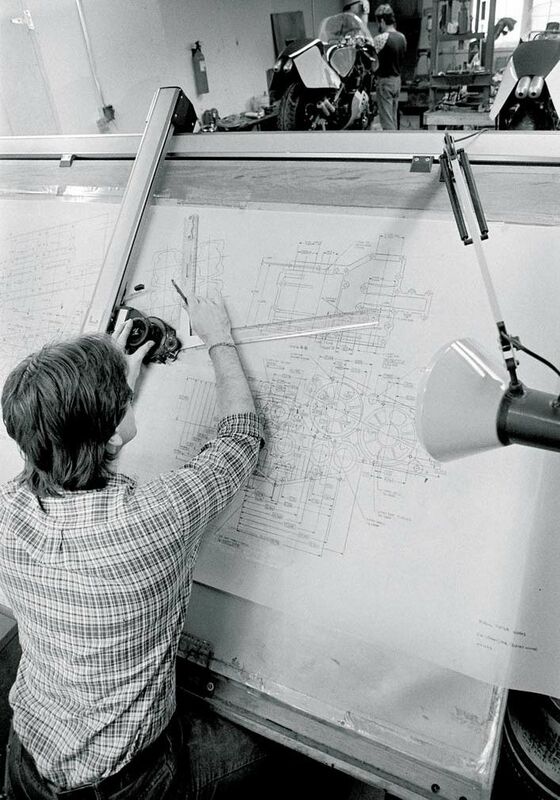 Buell set up a large drawing board in the “barn” so he could draw the RW 750 engine components. 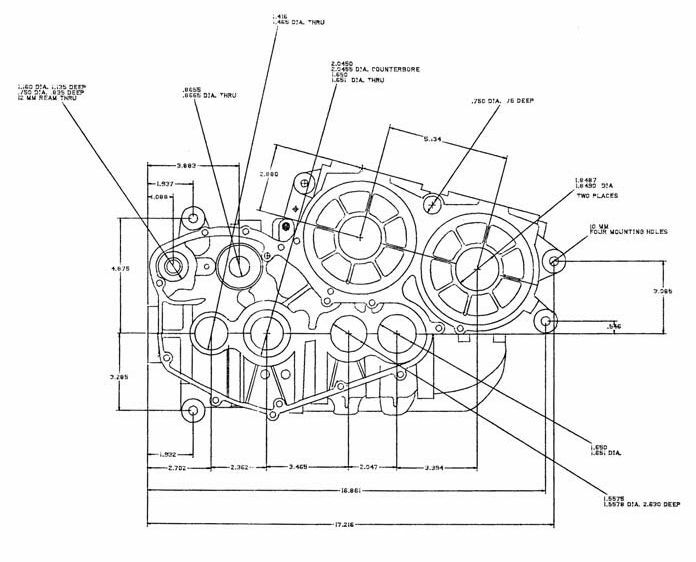 An original drawing of the RW 750 crankcase produced by Erik Buell. This is part of the drawing that is on the drawing board in the picture below. could. Erik took to heart Zero’s commitment to customer service and it bremains a guiding principle for Erik and Buell Motorcycles. the owners faced him down with the pistols they carried; Erik knew it was time to move on. ones; they decorate the rear windows of campers all across America. Erik decided it was just the thing to brighten up the boring white gel coat. This decision may have had something to do with lack of sleep, but for whatever reason a pair of these beauties ended up on the bike. When he rolled the bike into tech, the inspectors took one look and flunked him. They would not let him race until he took the decals off. (despite the name these were high quality race leathers made in England). The exchange rate really favored the dollar so this was a very nice little business. feel, good heat transfer, and good life but is prone to rust and is very heavy. Aluminum is very light and has excellent heat transfer properties but wears out quickly. 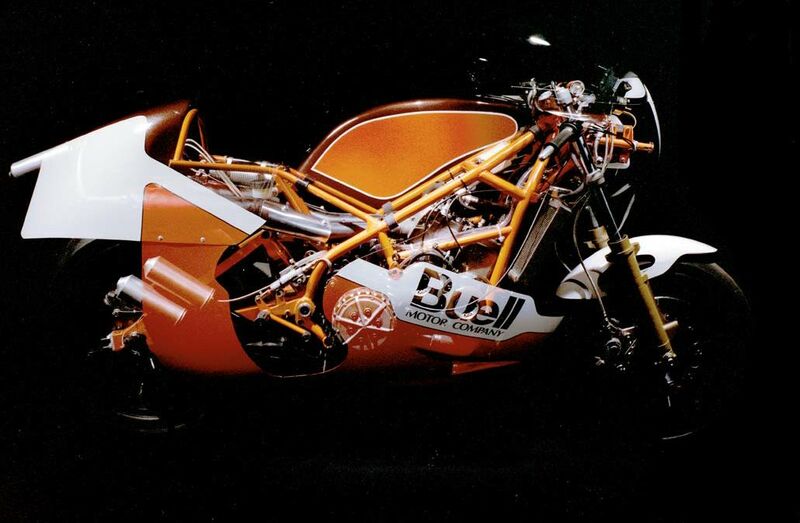 Sales literature was produced for the products Buell sold through his Pittsburgh Performance Products company to support his racing. 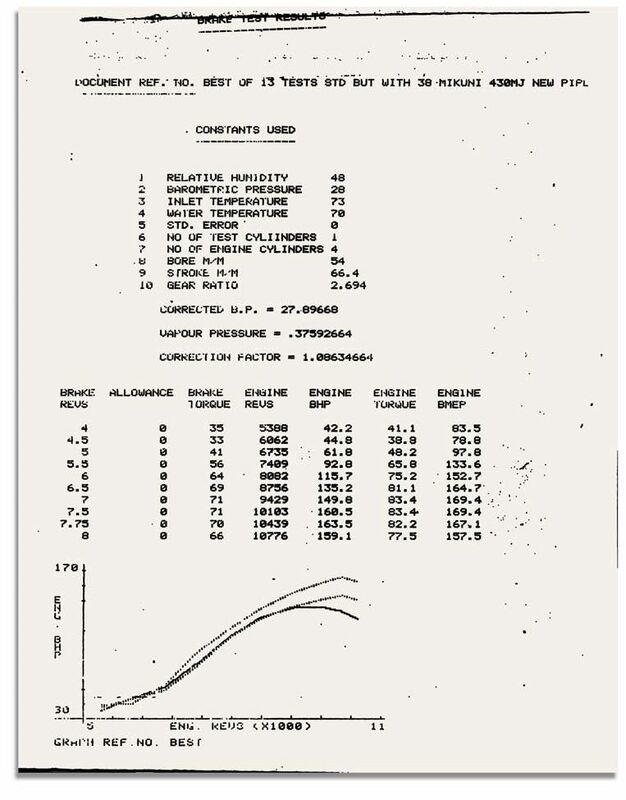 reduction in rotational mass and unsprung weight. You can see from the ads that Buell’s current ZTL brake system is not just “marketing speak” but a further development of a long-held belief. they built was for the movie “Silver Dream Racer” which starred David Essex. The chassis followed common wisdom at the time that too much stiffness was not good, and that the right amount of flex in the chassis would result in a nice-handling motorcycle. This sometimes actually worked for the underpowered, skinny-tired bikes of the early two-stroke era but with the power the 750 Barton was making by 1981, a flexible frame was almost unridable. cheating—if you have used the valve springs from a 1936 Super Duper while only 1935 valves are allowed, the post-race teardown is supposed to catch that. They also enforce standards involving appropriate decals and the like but safety is the first and foremost task of the inspectors. Imagine his surprise when Erik rolled his bike back to the pits to ready it for the first race only to find that the frame was cracked in three places. Seems it was okay if his bike folded in half at 150 mph but it was not gonna have a big old bass on the side when it crashed! In the mid ’70s, to help raise money to support his racing and also to cut costs for parts, Erik set himself up under the name of Pittsburgh Performance Products as a distributor for some of the parts he needed. This enterprise would prove to be a lifeline at key points in the future. recruit locals and were not all that big on college grads. Erik had to get himself to Milwaukee and talk his way in. That he did, and once there his talent and drive quickly made an impact. He started out doing testing and analysis; his first job was tracking the oil usage on Shovelhead test bikes. This consumed a lot of time as you might imagine. Shovels were never known for being oil-tight. He quickly rose through the ranks to lead the chassis development team for the FXR project. His personal racing was also in progress. He owned and raced a Ducati and a TZ750 Yamaha, the latter running in the old Formula One (F1) class. His racing program was moving along fairly well for a couple of years but things were about to change. one of the sweetest handling Harleys of all time (these bikes became one of the favorite rides of the Hell’s Angels because of this), and a head full of knowledge that Erik would find useful for years to come. Erik’s career was going well but his racing was not. He was fast but the Yamaha was old and wearing out. He was also concerned about racing a Yamaha while Harley-Davidson was locked in a life-anddeath struggle with Japanese manufacturers; it was becoming increasingly obvious that racing a Yamaha while working for Harley was not appreciated by people in the corner offices. Erik considered two solutions to these problems. The first involved an obscure British company called Barton Motors, which had built a 750cc square four two-stroke race bike. The second involved convincing Harley-Davidson that they should take the Sportster motor and build themselves a real sportbike. 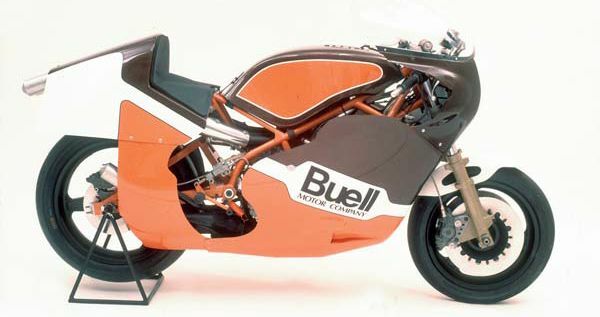 Buell designed a nice stiff chassis, it bordered on the suicidal. Carmine Vara and Erik produced these packets in an effort to attract sponsorship for what would eventually become the RW 750. They got no takers. Erik was watching the ambitious Barton motorcycle, which costarred with David Essex in the B movie “Silver Dream Racer,” when the TZ’s chassis broke. 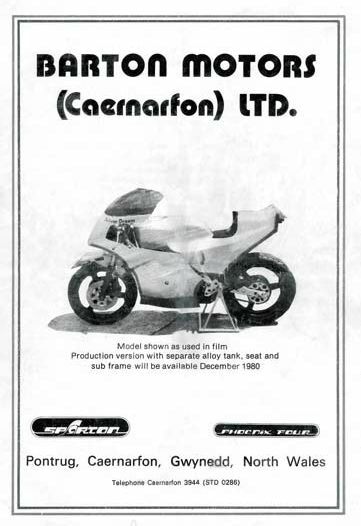 The Barton looked to be the answer to his problems, so he bought the Barton bike in late 1980. Actually the bike was just the beginning of his problems. The second solution got about as far as you might imagine. It would reappear after the first solution collapsed but we will get to that later. The Barton bikes had shown potential with 500cc engines but the larger 750cc displacement did nothing to help their already questionable reliability. In addition, the chassis was decidedly marginal. Not to disparage Barton—after all it was a couple guys in an ancient abandoned church attempting the impossible—but their lack of resources resulted in a motorcycle that was not going to take Erik into the upper reaches of the AMA pro ranks. However, it was fast. Erik felt he could fix the problems. He was, after all, very knowledgeable about motorcycle chassis design. 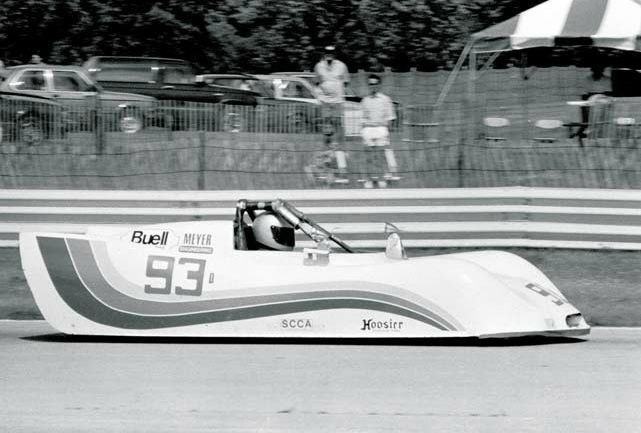 Bill Meyer in his Buell powered Ocelot at Road Atlanta for the 1985 SCCA National Championship races. Meyer was the last of the sports car guys to give the engine a try. Meyer found the motor “reliable and fast.” He won the SCCA round at Summit Point in August, but at the National Championship races the ignition system failed. That was the last gasp for Dave Ammen and Greg Rutherford purchased Barton engines to use in a SCCA D-sports racer. 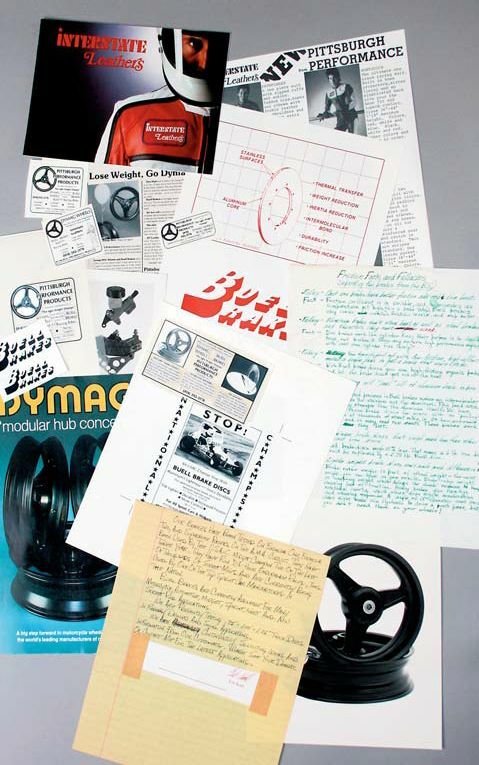 This class allowed 850cc engines of any configuration. The Barton had a real power advantage over other available engines but proved to be very fragile. “We were consistently faster than everyone else, but we could not get the engine to last,” Ammen said. “It needed more work and financial backing than we were able to give it.” Ammen had to make his own set of gears. “The gears were just not able to handle the weight of the car,” said Ammen. Fortunately he was in the business of making gears. He managed a couple of wins and qualified for the National Championships a few times but gave up after not being able to overcome the reliability issues. The 750cc engine also saw use in Nigel Rollason’s sidecar rig at the Isle of Man TT and it is there that Barton had its best results. Rollason managed a second in 1979 and a first and third This advertisement for the sports in 1986. He was consistently fast from 1979 until 1987. By the car motor ran in Sports Car time of his victory Buell owned Barton and some of the pieces in magazine. the winning chair were more Buell than Barton. bike after running in the premier class was not an acceptable option so Erik really had to buy Barton. He was convinced he could make the business work and sell some motorcycles. 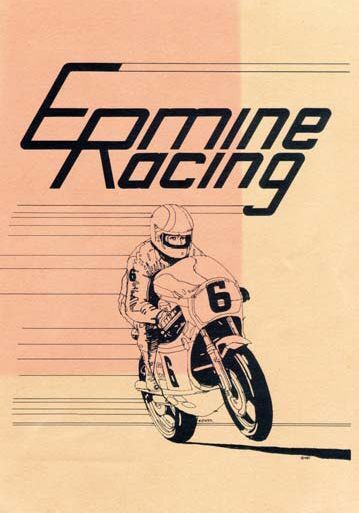 There was a market for a decently- priced replacement for the TZ750 in AMA racing. It took until very late in 1982 to arrange all the details and then in early 1983 Erik wrote the check. He was in the motorcycle business. Unfortunately, by the time the pieces all arrived, the 1983 race season was half over and valuable development time was lost. It usually looked like this in the shop at the farm, where you can see one partially assembled RW 750 and one bare frame. 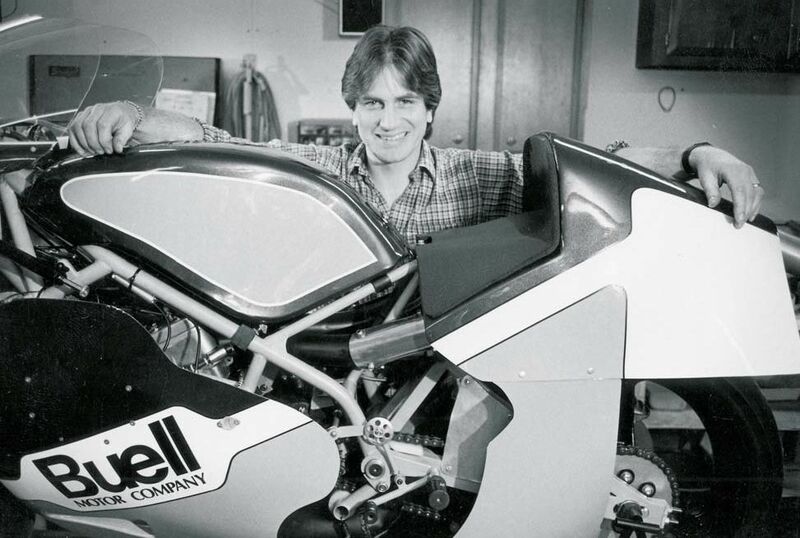 When the first “production” RW 750 was finished, Erik Buell and Dave Gess set up a photo shoot. Dave had access to a portrait studio at that time; it was decidedly marginal for what he had in mind but when you have no money, you have to make it work. (Making it work was a recurring Buell theme!) Dave borrowed yards of black velvet material from a photographer friend and draped the studio in it. Two exposures were taken, one with the bodywork off and one with it on. The result is this ghost image. Erik would later credit this picture as the inspiration for the translucent bodywork on the City-Cross model of 2005. 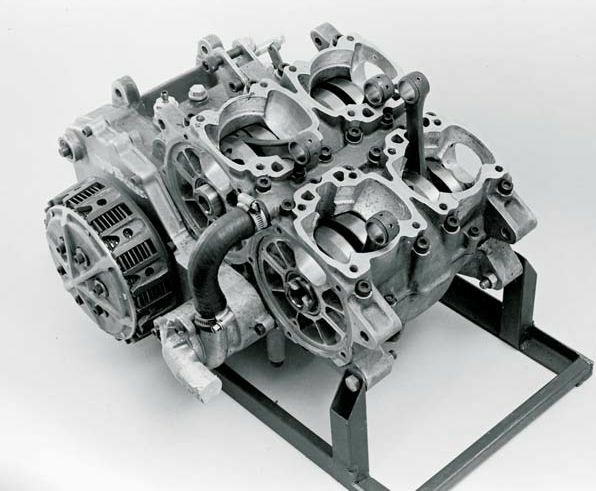 The RW 750 engine was a 66.4 x 54.0 mm bore and stroke, rotary valve square four. It featured two twin-cylinder crankshafts geared together. There are four separate cylinders. Many of the parts were designed or redesigned by Buell, including the pistons and the flywheel. 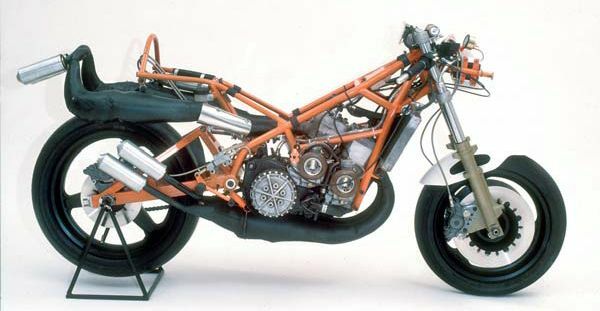 The engine started life as a 500; there was also an 850 version in addition to the 750 that Buell raced. 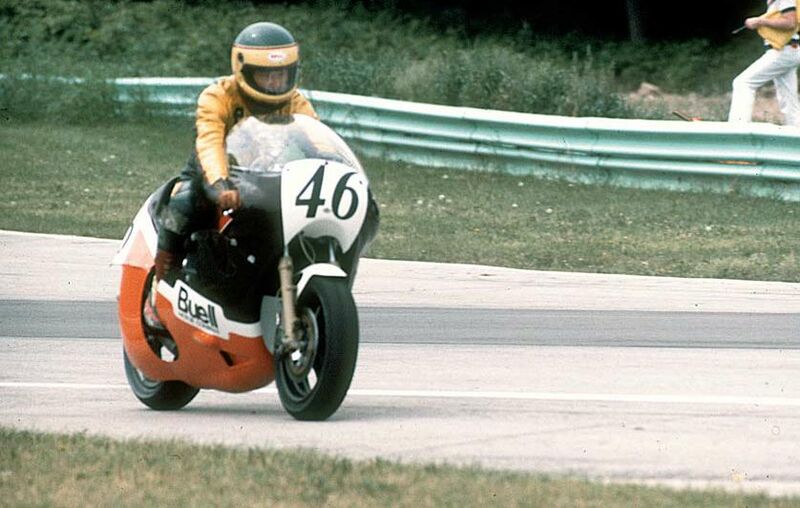 Doug Brauneck on the RW 750 prototype during practice at Road America in 1984. America that year Doug Brauneck, one of the top privateers, was entered to ride the bike. He did a lot of practice laps and was impressed, but he was concerned about reliability and, at the very last minute, decided to stick with the slower but reliable Yamaha TZ750. Erik literally jumped into his leathers and ran to the start line. He only completed one lap before the water pump drive sheared. Dave Gess managed to get one shot of him aboard the bike. ground. He broke three ribs. The bike did not run at Pocono. 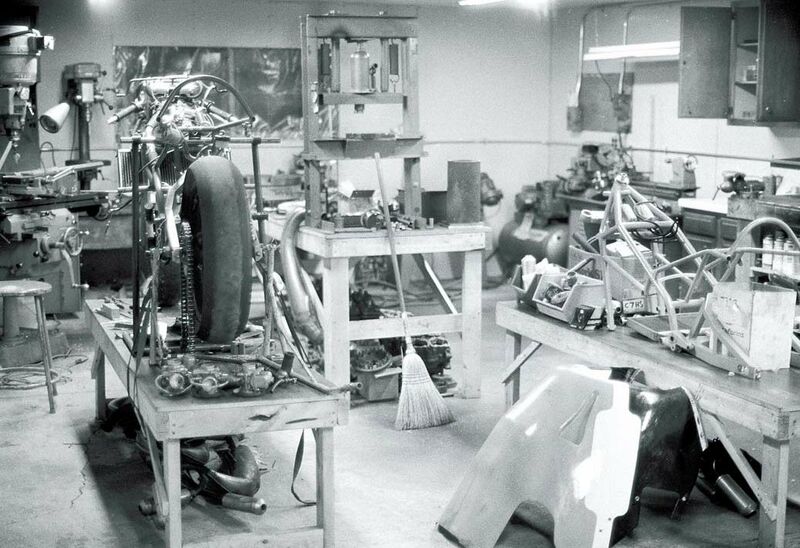 The one-car garage in Milwaukee, where Erik started to develop the RW 750, became increasingly difficult to work in as the RW 750 project grew. This farm near Mukwonago, Wisconsin, was a perfect location for the project. The barn itself, on the left, was used for storage of leathers, wheels, and general parts. The small building in front of the barn was the office. It may have started life as a milking shed and is attached to the barn. The out-building on the right was the actual “factory” where the RW 750 was made and early RR 1000s were built. have the option of coming back after six months. He was not coming back.) His parting was on exceptionally good terms—something that would prove important in the future.To develop a race bike Erik needed cash, so he sold his duplex and found a run-down farm to rent in Mukwonago, Wisconsin. 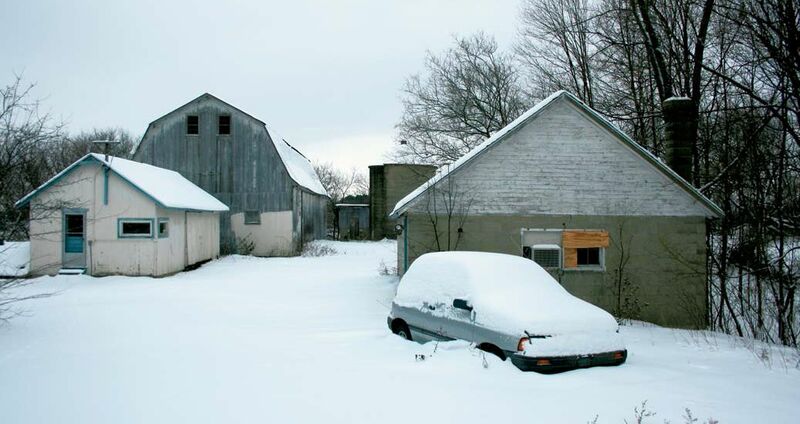 The farm was a long way from any neighbors and had a nice garage building as well as a barn. It was an ideal place to build and test a race bike. He would generate some income by stepping up his Pittsburgh Performance Products business. the plug on the class. Formula One would go away and the growing Superbikes would become the premier class. Overnight Erik’s market was gone and along with it his business. 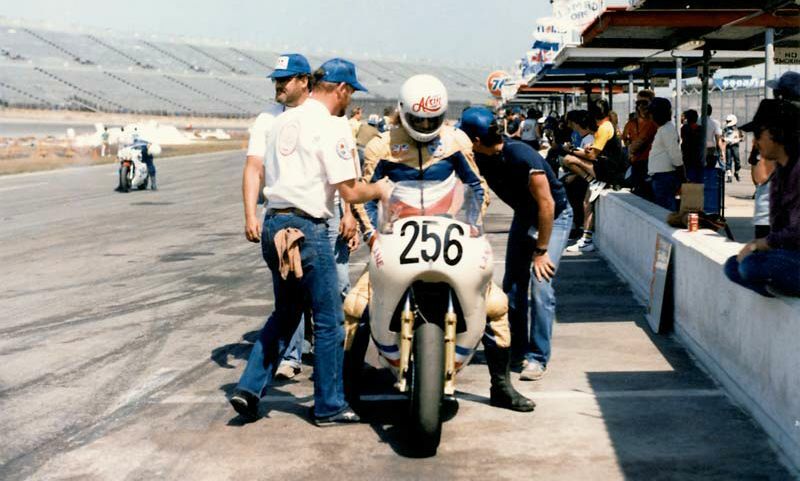 Alan Ladd aboard the Machinist Union RW 750 prepares to go out for practice at Daytona. Ken Winpisinger is standing at the left. starters. A few guys didn’t make the race but the AMA official at the line straddled the front tire and grabbed the faring not letting them go out. He actually wrenched the fairing so hard he cracked it. They never ran a lap. To add insult to injury they were listed as 80th, last place in the official results posted the next day. “I was furious, they wouldn’t let us start and then they said we finished last,” said Winpisinger. The best finish all year was second in a club race at Summit Point at the end of year. “I felt we had a pretty good package by the end of the season and was confident that we would have done well if the class had survived,” Winpisinger said. “It was very frustrating.